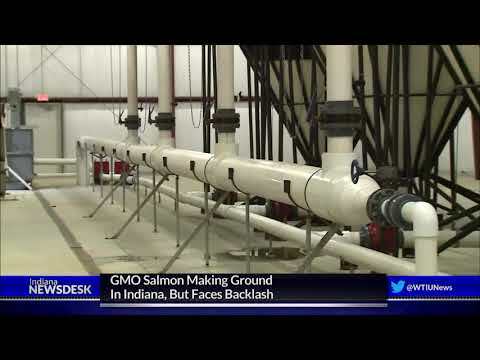 AquaBounty Technologies has developed a biotech salmon that it plans to grow near no major body of water, in a production facility in the small town of Albany, Indiana. A consumer advocate group is urging the state to deny Vectren’s proposal to build a $780 million natural gas plant. The Indiana Office of Utility Consumer Counselor says Vectren needs to explore all its options. Guard officials expect to tear down 14 buildings this month; they’ve already helped city workers demolish 22 structures. Experts say the tariffs’ burden on farmers could be limited if the Trump administration makes a deal with Canada and Mexico soon. Indiana started its new fiscal year on a positive note, with tax revenues that slightly outperformed expectations. Purdue University’s Ag Economy Barometer, which measures producer sentiment, has seen record declines following establishment of the Trump administration’s tariffs. The Terre Haute City Council called a special meeting to review the city's budget plan, which shows steady improvement. Board President Mike Johnston outlined two options for members to consider: trim back plans for their retail store or scrap the plans altogether and cease to exist.